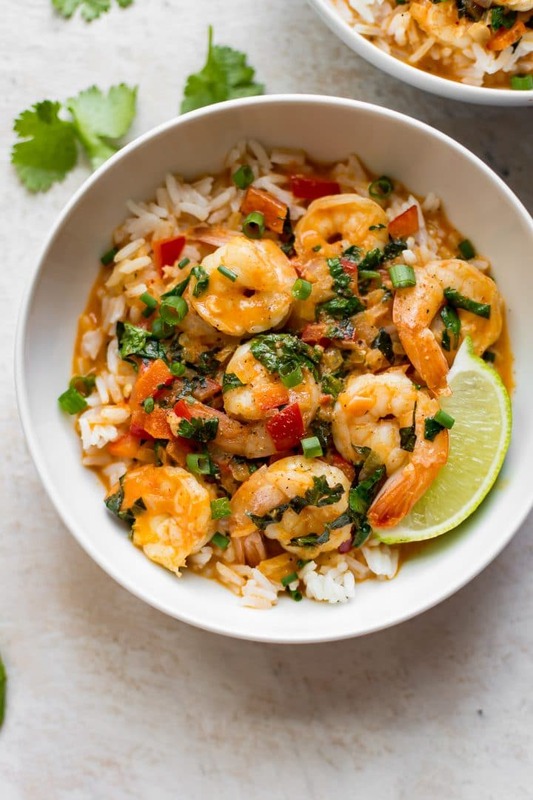 This easy Thai shrimp curry recipe is quick, simple, and there’s plenty of sauce for the rice! Ready in less than half an hour. 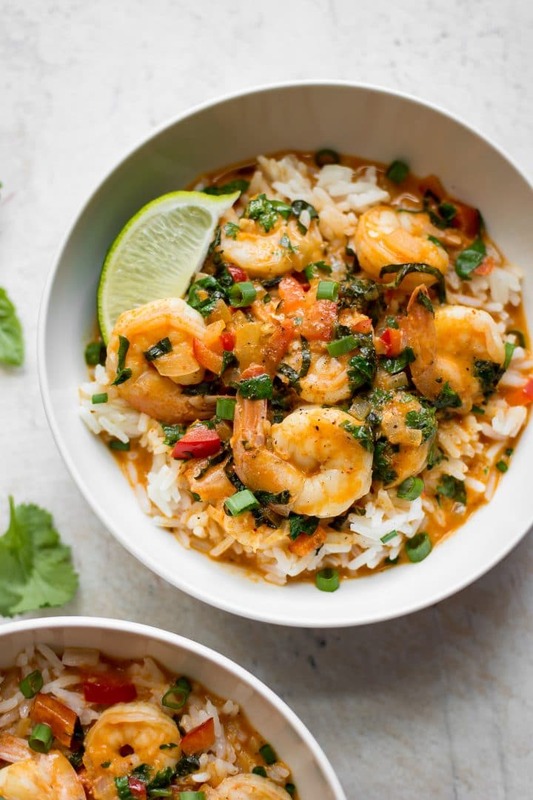 I love a good coconut sauce, and this coconut shrimp curry doesn’t disappoint. I kept this recipe pretty simple so it comes together fast. Shrimp cook very quickly, so once you actually get cooking, it doesn’t take long at all. It’s also fairly healthy. It’s been a while since I last posted a Thai-inspired recipe, but I do have a few others on here if you are interested like my Thai chicken curry soup, 15 minute Thai green curry soup, this Thai sweet potato curry, or my Thai turkey soup. I love the contrast between the rich coconut sauce and all the fresh herbs… that’s probably my favorite thing about Thai recipes. It’s not quite time yet for my garden basil, but it’ll be coming soon(ish)… can’t wait. The growing season here in Canada isn’t exactly long, but I’ll take what I can get lol. Prep your shrimp. If using frozen shrimp, run them under cool water until they’re fully thawed. Add the lime juice, season with salt & pepper to taste, and add the fresh herbs. I love serving this Thai curry over white jasmine rice. Want to make it spicy? Try adding some chopped fresh Thai chilis or some dried red pepper flakes if you have some in your pantry. What kind of shrimp to use in Thai coconut shrimp curry? I used 31-40/pound count frozen raw shrimp. You can use smaller or larger shrimp if you want; just adjust cooking time by a minute or two as needed. Let me know if you’ve made this easy coconut shrimp curry! 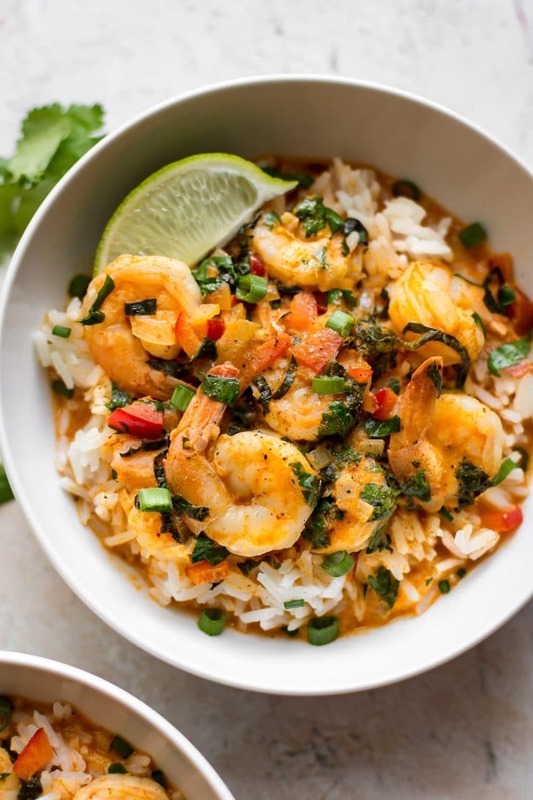 This easy Thai shrimp curry recipe is quick, simple, and there's plenty of sauce for the rice! Ready in less than half an hour. If you want to serve this recipe with rice, I suggest getting the rice going prior to starting the curry. Add the oil and onion to a soup pot over medium-high heat. Sauté the onion for 5 minutes. Stir in the garlic and curry paste and cook for 30 seconds. Add the chicken broth and fish sauce. Let it come to a boil and cook for a couple of minutes. Add the shrimp and red pepper. Let the soup simmer gently (don't let it reach a crazy boil) for 5 minutes or until the shrimp are cooked through. Add lime juice to taste (I used 1/2 a lime) and salt & pepper as needed. Add the cilantro, basil, and scallions prior to serving. Serve over rice (I love jasmine rice). I used Thai Kitchen brand red curry paste. Anything from 3/4 pound to 1 pound of shrimp will work. Super easy and very flavorful! Loved this! My boys (4 and 6yrs) both ate it up. My husband did not. Lol! Can’t get that man to like seafood. But 3 out of 4 is still a definite win! Passed this recipe along to my mom friends too. Thank you!